I made the connections without using transition moldings, which would add 1/2″ clearance to my transition. Instead, I cut a grove in the bottom of connecting hardwood plank, and overlapped it on top of the tile. Now my “step” is a barely noticeable 1/4″ and nobody ever trips over it. It’s clean and smooth! I installed the hardwood using NuMax flooring nailer / stapler which worked out great, and my cost was just $100 + tax! During installation of 500+ sq. ft. of flooring, I only had 10-12 bad nails/cleats! 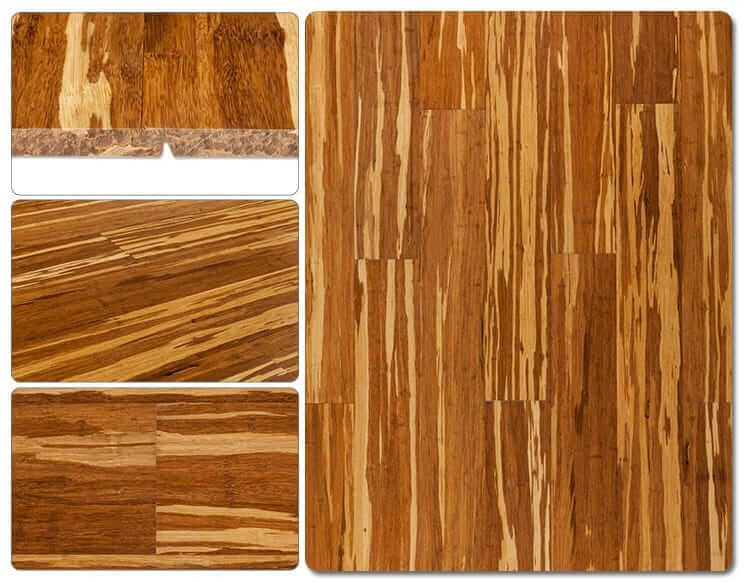 The Tiger Bamboo flooring looks absolutely awesome! BUT … I let my bamboo adjust to room temperature for 1 YEAR! However, in the winter, when air in the house gets dry, the floors contracted so much that I had a 1/4″ gap between rows in the middle of the room, and in summer, when air gets very humid – the floors expanded so much that I had some rows pop up! As mentioned below in this guide – bamboo floors dave a lot of issues, so you should keep these in mind, if you get bamboo. Bottom line: I personally will never buy bamboo floors ever again, while the Brazilian cherry I’ve very happy with! 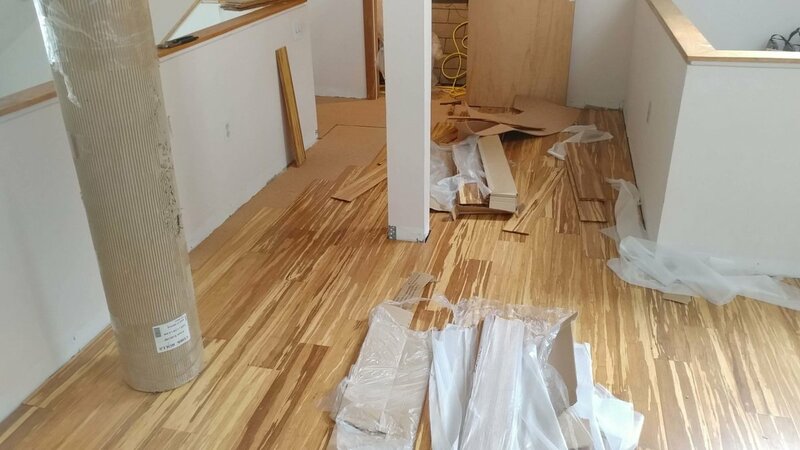 Original Article: A major part of my DIY total home renovation project, is installing new hardwoods in my living room, bedroom and office. Many other aspects of the remodel process have revolved around floors, and I needed to finish a number of different things before I could actually start the installation. For example, I could not start doing the floors until I insulated my post and beam ceilings, and painted all walls. Basically these two were very time-consuming projects that had to be done BEFORE I installed floors, so I would not damage them, and would not have to worry about paint drips on new hardwood. As the above mentioned steps are nearly complete, I had ordered my new hardwoods from BuildDirect. It took me over a month to select the right products, as my wife and I had to agree on colors, style, and cost (guess whose main priority was color, and whose was cost 🙂 ). Why did we choose BuildDirect? It wasn’t my first choice to go with an online store, because I like to touch and feel the products that I buy – especially those that will cost several thousand dollars. Therefore, my first choice was to go with local flooring stores. But as we started visiting these stores, we discovered that their prices were RIDICULOUS! I mean the very basic Oaks started at around $5-6 per sq. ft. And anything nice like Hickory was in the $7-10 / sq.ft. range – for a 1000 square feet we were looking at over $8000 just in materials, and that is without underlayment, nails, and all the other accessories. Our total would be $10K without labor (since I’m doing everything myself, labor is “free”). 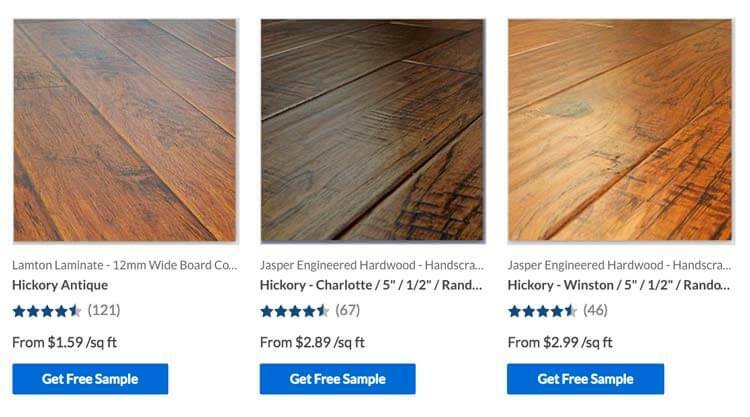 If you want to know how much flooring installation would cost if you hire a contractor, use our Flooring Calculator tool or see our detailed guide about hardwood installation prices. Next, I started looking at flooring options at Lumber Liquidators (LL), PayLess Floors (local company with 2 stores in Walpole and North Attleboro, MA) and online flooring shops. Both local stores did not have good prices for what I liked, and were still much more expensive that online shops. What flooring did we choose for Living Room and Bedroom/Office? After going through over 20 samples of hardwoods and bamboo floors, we liked Hickory, Jatoba or Brazilian Cherry, and Tiger Stranded Bamboo. Hickory was more that I wanted to spend ($5.19 /sq. ft), but $2 less than local “bargain stores”. Bedroom and Office: I REALLY loved Tiger Stranded Bamboo, and PayLess floors was selling it for $6-7 / ft, depending on thickness and plank width. BuildDirect sells is for $2.48, and I got it for $2.18/sq ft on sale! So figure that we saved $4/ft. Living Room: As I mentioned – my wife and I really liked Hickory and it was one of the very FEW floors that we both agreed upon, but price was still too high for my liking. So we looked very hard for alternatives in looks, quality and better price. We chose Jatoba (Brazilian Cherry Hardwood) which was $1.60 less, and actually is Hand Scraped hardwood, which I really like for some reason. Jatoba has very similar color variance to the Hickory, albeit a bit darker, but with over $1000 in cost difference vs cheapest Hickory that we found, and a Hand-Scraped look, and most important – my wife’s approval of color, I went for this. 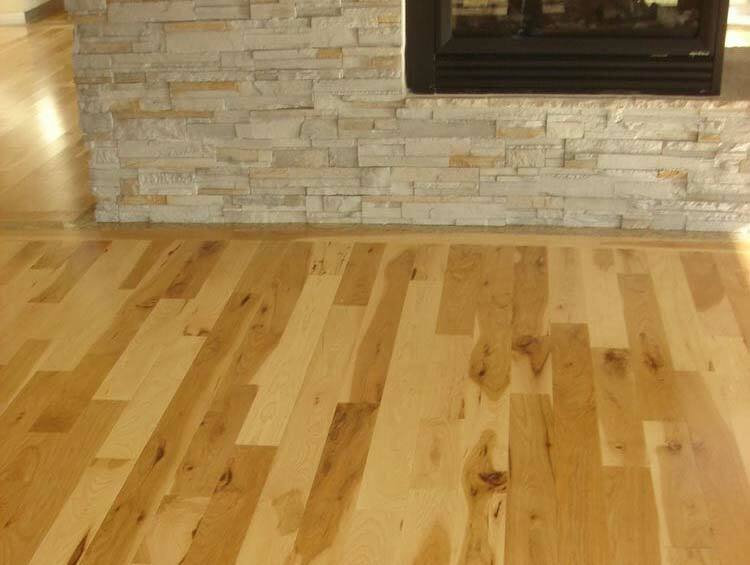 For any hardwood installation, you need underlayment. Using pink paper is for amateurs and rental apartments. I wanted the best, at VERY reasonable price. The options are many, but mostly you have synthetic materials, fibers or cork. I really don’t want synthetic underlayment or fibers, so I went for Cork. Cork is actually much cheaper that synthetics / fibers, and is all natural – so no formaldehyde or any other nasty stuff, and I went with a 6mm thickness, so even with some imperfections in my subfloor, I don’t need to do any leveling work. It will also greatly reduce any squeaking noises when we walk. 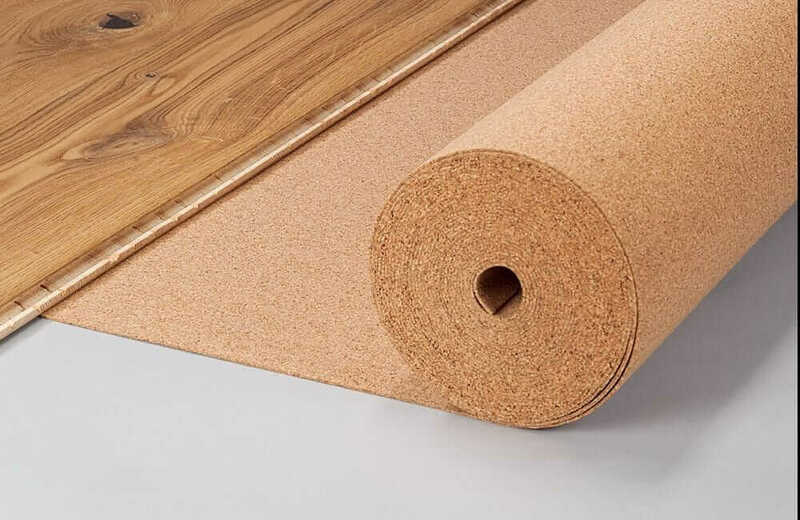 I paid $0.53/sq ft for cork Underlayment – local store prices were about $1/ft. The Jatoba is pretty unique to BuildDirect, and I had a hard time finding similar product online (in terms of color/looks) but basically Brazilian Cherry 3″ Hardwood goes for about $5 or more. And $5 options are not hand-scraped! So I figure I saved at least $1.50/ft. Hickory, which was our first choice starts at $5.50 for contractor grade, and goes to $7+ for better grades in 3″ width. Therefore, I saved at least $900 on Jatoba Hardwood, but more like a couple of grand. Because the product I got is Really Nice, top grade, hand scraped 3/4″ hardwood! And finally 6 mm Cork sells for about $0.79-1.19 per foot, so I saved at least $286 on cork. My total savings VS online shops (of unknown trustworthiness) is at least $1831, and more in the range of $3000-5000 if we include local budget stores. I am excluding flooring stores in busy shopping areas such as Routes 1 and 9 around Boston, where prices for hardwoods start at $7-9 and go to over $20. So today I received my shipments, and not without hurdles and hiccups. I still need to do visual inspection of the products. There is a lot of important things to talk about, so I want to discuss this in a separate post, which I will publish later today or tomorrow, and if you plan to buy from BuildDirect you should really read it. I will post a link here when the post goes live.